French Toast Casserole (!!) featuring creamy ricotta cheese, fresh summer berries, and homemade brioche. Cause all we do is win win win no matter what! You’re gonna love it. Oh sweet baking! How I love/unlove it. Love = the warm, bready smells. Love = the taste-testing along the way. what else is a spatula for though? Love = the finished product. 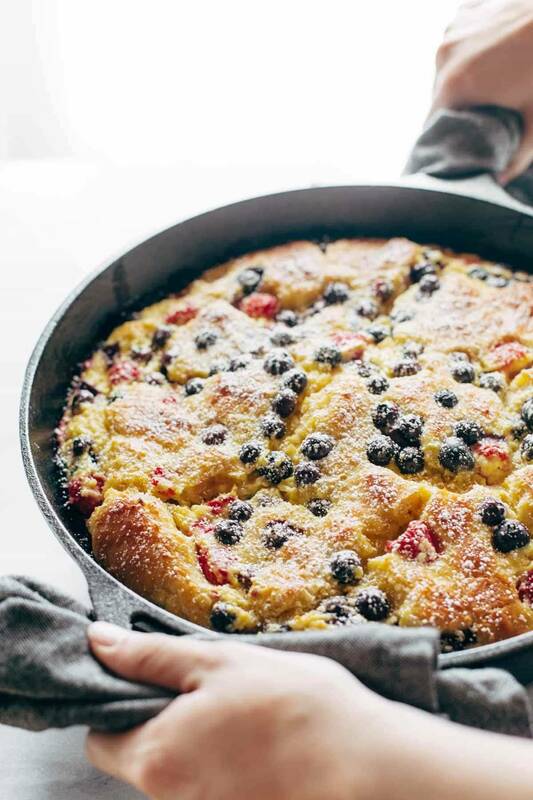 because when that beautifully deep skillet with golden brown French Toast and berries lands on the table, in a moment of transformation you go from regular person to full blown BOSS. you have just made baking history with your skills. you might be the most domestically gifted person alive right now. So mostly I love baking. But there’s that one little thing that I UNLove = the lack of flexibility. I have gotten so … I don’t want to say sloppy, but that’s sort of what it is … can we just say casual to preserve my self esteem? I’ve gotten so CASUAL with the process of just cooking and adjusting on the go for easy dinner recipes (taste // add more salt // taste again // give it a shot of lemon zest // more tasting // roast it a little longer) that I feel like I’ve totally lost my stamina and patience with baking. I mean, you cannot adjust these things real-time when you are working with fussy ingredients like YEAST and EGGS and BUTTER and FLOUR and by the way – is my oven temperature possibly off by a few degrees? Ugh, baking. Just loosen up already. But there comes a time in life where you have to ask yourself the most important question: am I willing to get my bake on in order to end up with a big old school style of everything-in-one-large-pan French Toast Casserole on my table? French Toast Casserole – let’s break it down. A) French Toast because breakfast is so good and carbs are life, B) Casserole because it is fun to share food, and C) bonus note that this is not a super flexible recipe necessarily, but to my comments above about it being fussy and all that? this is actually a relatively easy recipe as far as homemade completely from scratch baking awesomeness goes. Such as golden brown French Toast baked in a large dish and bombed with ricotta and berries. This French Toast Casserole is meant to be shared with all your best people – I mean, this heavy dish of breakfast glory is going to weight at least 800 pounds, so text your squad NOW, girlfriend. You’re going to need some help with this one. I know, I know, having people over sometimes feels a little panicky, but brunch seems moderately approachable when it comes to hosting, right? French Toast Casserole is your jam for this. Look out, brunch goals. We are on the loose. Here’s the deal with the dough. You have two options. Store bought pre-made dough from a can, like those biscuits that everyone uses for everything. Homemade brioche that will blow your mind with how easy and amazingly delicious it is. K, it might be obvious which one I’m pushing for here, but let me just say this – I am not above the canned biscuit situation. If I were really pressed for time, I might just go there. No snub noses here. But know this: I AM pressed for time 99% of the times that I’m making something like this for some kind of brunch event and I STILL find it worth the extra five minutes that it takes to make the homemade dough. 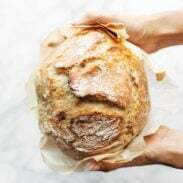 I said FIVE MINUTES because the recipe I’m using comes from Artisan Bread in Five which is based around the concept of baking bread with just five minutes of prep for the dough. Could this be any easier? This is baking for casual girls. This is where I live. It’s buttery, rich, a tiny bit creamy thanks to the ricotta, and speckled with juicy bites of raspberry and blueberry that sort of explode with goodness in each bite. Topped with powdered sugar and syrup and you are gonna be rocking those brunch goals. 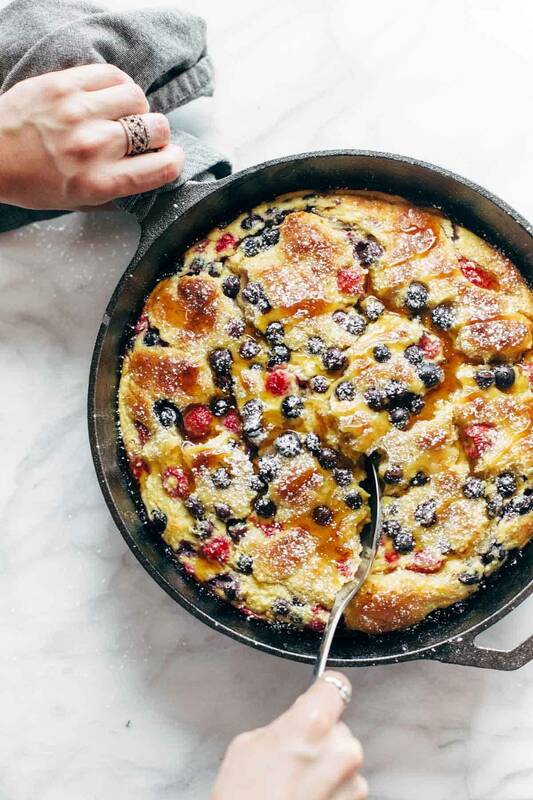 French Toast Casserole with SUPER EASY 5 minute homemade brioche, ricotta cheese, and berries. No canned biscuits! So delicious! Dough: Mix the eggs, butter, water, honey, salt, and yeast in a bowl. Add the flour and stir until just combined (you can just use a wooden spoon for this – no mixer necessary). Cover with plastic and set aside (at room temp) for about 2 hours or until puffy and sticky. Split the dough in half and freeze one half for later. Coat your hands and your surface with plenty of flour, roll out the remaining half batch, and cut it into bite sized pieces. Filling: Preheat the oven to 350 degrees. Whisk the eggs with the ricotta cheese and honey. Add the bite sized dough pieces and the berries. Stir gently just once or twice to combine. Bake: Transfer to a greased 9×13 casserole dish and bake for 30-ish minutes, until the top is golden brown and the insides are fully baked. Sprinkle with powered sugar and syrup. Sometimes the dough can get really sticky. I am pretty generous with the amount of flour I use – also, you can chill it for a while to make it less sticky. In terms of how to cut it into bite sized pieces, I usually roll it flat, then roll it into a log, and then use a kitchen scissors to cut. yeah most French Toast Casseroles are made with baked bread so I thought I’d try something different! I saw a Tasty video on Facebook the other day that was similar to this which was what inspired it! This is my favorite kind of breakfast! Will the dough be okay if it is made the night before and kept in the refrigerator? I’d love to make this this weekend but my family doesn’t like to wait for breakfast. yes! I would leave it at room temp for the 2 hours to rise, but then store in the fridge till the next morning and let it come back to room temp again before baking. Oh my goodness. This looks so delicious. I need to make it ASAP. I have never made brioche dough, but you have completely demystified the process. Thanks. This looks delicious! Is whole milk and ricotta cheese two separate ingredients? If yes, how much of each? Hey, Susan, glad you asked because I have the same question. In the recipe it says to whisk eggs with ricotta, milk and honey, but it seems the milk quantity was left out in the recipe list? Whole milk is the type of ricotta cheese. There is whole, part-skim, etc. No additional milk would be needed. Generally, you can switch them out. It may change the creaminess factor. Thanks for jumping in Corinne! 🙂 right on. Ok…I give up. I am just plain too lazy. So, if I wanted to use biscuits instead of this lovely Brioche, how many cans of the not so lovely biscuits should I use? And, much like Monkey Bread, do I cut the biscuits into quarter pieces? Yep! Just like that! And I would use one can. It should be enough to cover a 9×13 in a single layer. Can I make the brioche dough at night and keep overnight in the fridge (instead of leaving fo 2 hours at room temperature) and make the casserole in the morning? I am craving this casserole! It looks so delicious! Thirty has made you so creative 😉 🙂 LOVE this…so gorgeous…can’t wait to try it! Soooo, if hypothetically I was too lazy to get up early enough to mix the dough before breakfast, could I make the dough the day before, let it rise, cut it up, and put it in the fridge for the next day? yes! exactly! I would let it come back to room temp before baking just to make sure the bake time is right. This French Toast Casserole with the homemade brioche sounds soo amazing!! Ha! I hear you about the non-flexibility of baking! Thanks Amy! Hope you and the girls love it as much as we did! I’m guilty of resorting to canned biscuits every once in awhile…but I can imagine using homemade brioche makes this extra delicious!! Looks beautiful, too. I will have to make this recipe the next time I’m hosting overnight guests. Not the end of the world by any means! they are so quick and easy and I totally grew up eating them so I have a soft spot in my heart for those little fluffy things 🙂 but man, once I discovered the bread in five concept I was HOOKED. Yesss new brunch recipe for Sunday, for sure! The brioche in this recipe… wow. I’ve been doing low carb for a bit, and I think that is about to go out the window. yay! Why aren’t you posting nutrition facts anymore? I have never done nutrition facts for desserts. 🙂 Splurge! Your picture looks like a cast iron skillet – what size would that be? Ha! And the reason I love baking is that it’s inflexible! Must be the engineer in me! This French Toast Casserole looks amazing and perfect for the next time I have house guests! Thanks for the recipe! Funny how that works, right?! 🙂 I am too much of a rule breaker when it comes to specifically following recipes! This look fabulous, Lindsay. 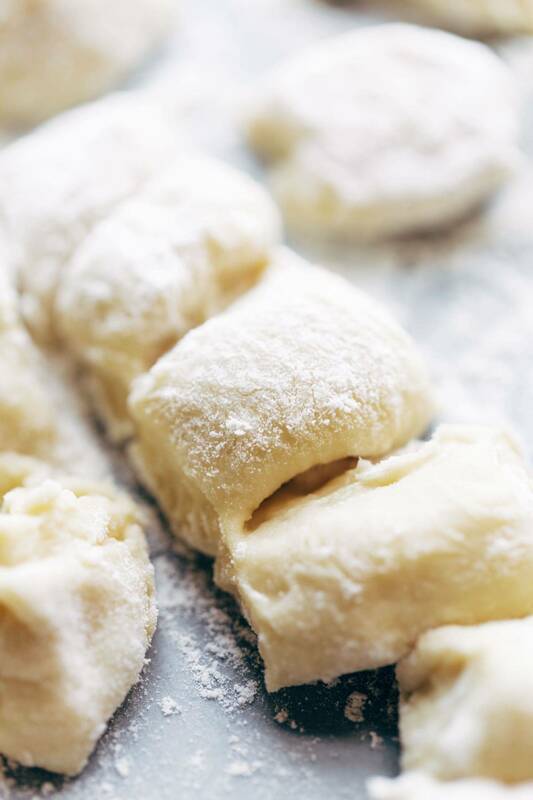 You had me with the beautiful picture of the fluffy homemade dough. When I see recipes using canned dough, I want to gag! Looking forward to trying this one! Wow! So pretty! I’m gonna try a whole wheat spin on this and I’ll let you know how it works out. awesome! excited to hear how that works for you. I like this recipe though, it seems pretty easy! I have been looking for something to make for breakfast Father’s Day and this seems perfect! Right? It’s the worst when you spend all the time waiting for the dough to rise and then bake it and then after all that it doesn’t work. 🙂 This one should be fool proof though! hope you like it! can the brioche dough be made the night before and left to rise in the fridge? Yep! We would leave it at room temp for the 2 hours to rise, but then store in the fridge till the next morning and let it come back to room temp again before baking. Lindsay, I would say by the picture of your Ricotta Berry French Toast Casserole that the extra 5 min. is worth using the homemade dough! It looks beautiful and SO appetizing!! I love French toast any way it’s made, nonetheless. Definitely! 🙂 Hope you enjoy it! This looks and sounds amazing! I cannot wait to make it. Could I make the dough the night before and put it together in the morning or would it rise too much and become unruly? Any thought? THIS I managed to make without mishap. Delicious and filling, will likely make for Christmas morning with family. Gladder still to know I can leave the dough in the fridge overnight. Thanks for the info! Glad you enjoyed it, Suzanne! Could i use thawed frozen berries? Yep, that should work fine! I’d just rinse the berries under water to remove some of the juice. I’m a baker and definitely making this for my next brunch! So delicious looking. Would you happen to have a modification of this recipe with apples instead of berries? Would I just add butter and brown sugar to the filing? Thanks in advance! We do not so can’t really say! We’d love to hear how it goes if you give it a try!